Thankfully Little Monkey is still young enough to want to wear most things I put him in. I’m sure if I strapped a pancake to his head, secured it with a ribbon and it kept out the sun, he would still wear it. 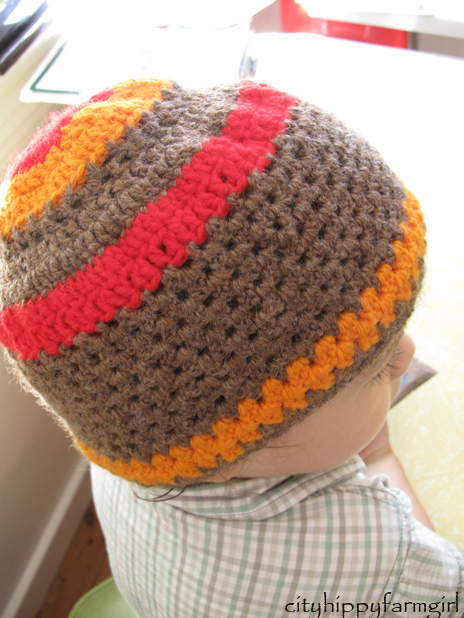 Pancakes aside, but with this philosophy in mind, I started crocheting my first hat. I had the wool, I had the hook, and I had the image of a lovely warm colourful number. A hat to keep small ears warm, with the little imp running around and looking rather dashing in his new hat at the same time. Now I just had to harness that imagery and put it into practise. Crochet and I were new friends, quite new friends. I was still practising and wasn’t quite sure how to make a hat rather than a… well, a pancake. Ah well, lets get cracking anyway. Reclaimed wool from my mum, who in turn had reclaimed it from someone else. Stolen moments at the playground after school to crochet, and a week and a half later Little Monkey can now wear his new pancake… I mean hat. This entry was posted in Going Green and tagged beanie, colourful, crafting, crochet, handmade, hat, wool by cityhippyfarmgirl. Bookmark the permalink. Very cute, now you just need some winter. It would come in handy here, there is snow all around us on the mountains and a very chilly wind blowing down from there. I am a little early. I’d happily have some of your snow on your mountain tops and a chilly wind. Little Monkey looks super cook in his new pancake-hat. Thanks Mandy. He was happy to wear it until he declared he was TOO hot, dripping in sweat, I think he was right. So cute! The hat – the boy- the story. I think you did a beautiful job- I really can’t master the one hook. 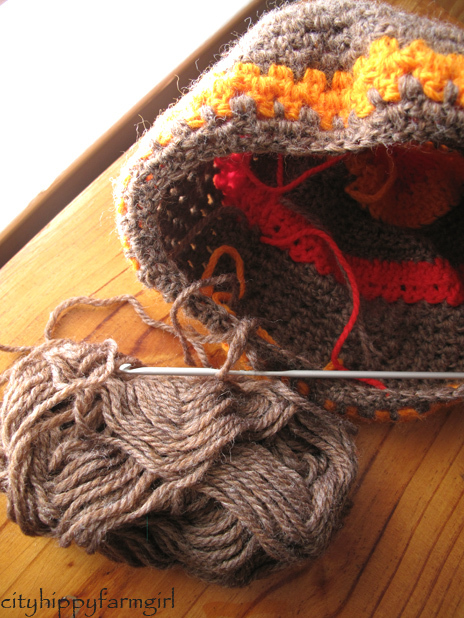 I need two needles to hang onto and keep track of the work. Thank you Heidi. You do make some beautiful things with your knitting! How cute is he!! The hat’s very nice too, B. 🙂 You’ll need to figure out how to put ears on it next for him! Enjoy dressing him while you can. He will have a mind of his own before you know it. Even so, I think he’d still adore this cute little number. The vibrant colours add that extra warm feeling. Very nice. Good on you! See that was a smart thing, doing a class… Me? Not so smart. It looks much better than my first attempt at a crocheted hat that’s for sure…actually pancake would be a great description of that disaster. I’ve seen your crochet. Girl, I don’t believe that for a second. You were born to crochet! I love the color combo. So you are getting some chilly weather where you are. You asked about the Northern lights. They are amazing. I have not seen them in awhile, but I have a memory of a few times that just blew my mind.